Finally breaking the ~llymlrs style~. Been wanting to change to doing full length for a while, I'm just a sucker for routine and I like things to be the same. Also I sorta felt like the way it was before was "my" thing and the no legs/shoes joke was just blogging-in-joke. Two good years I've done the above the knee thing, I think most people used to do full length when I first started blogging, now it seems to more common to do above the knee. Its much more awkward doing it full length, the main reason I did it above the knee was because I dont really have enough room in the room I do my photos as the beds in the way. I had to balance my tripod on the bed, which was alot harder than it sounds. And then straighten and crop in post production! Bit more effort, but I do like the way they've come out! For the record, I dont wear shoes indoors, and I do wear the same shoes pretty much every day (topshop albas, H&M flatforms or these pumps) so be prepared to see them all the time! The scarf was a Christmas present of my Granparents. I cant tell you how long I've wanted it this scarf for! Its such a gorgeous vibrant red tartan! In River Island style it had some disgusting embroidery saying "love" with some hearts on that I had to pick off, but I'm just so happy with it! Been holding off getting a scarf this winter because I knew I'd be getting this! Im back packing orders for JWLRY tomorrow to be sent on Wednesday! I've seen lots of photos of people who got given rings for Christmas, So glad you like them! ohhhh i love striped shirts! i really think they fit everything and it makes every single outfit chic and timeless... i love it with this mini skirt and this gorgeous scarf! good choice of your grandparents!! hope you are having a great start of your week! have a nice day! O EMM GEEE. she's got legs! I'm forever changing buttons and hemming things and fiddling with things from high street shops to make them bearable! I love the scarf ! Love the scarf! Not use to feet posts lol! Woaa, first thing I saw was your new gift. You grandparents gave you a beautiful and so-british-style scarf, indeed. And I love the combination of the tartan + stripes. Then I started reading and what, full lenght shots? Didn't even noticed that petit change, but I like it! (now the curiosity around your shoes will be revealed haha). Hope you have had a wonderful x-mas day and wish you all the best for this upcoming year. 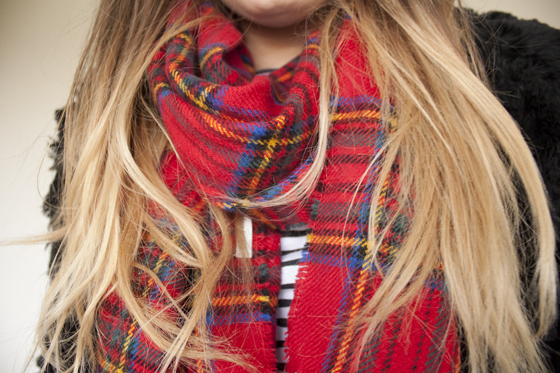 Gorgeous scarf, I love tartan it's such a fun well spirited print. I like the full length too, but I know what you mean, it is so hard, I have to balance mine on books ( need to invest in a try-pod when i get my new camera). 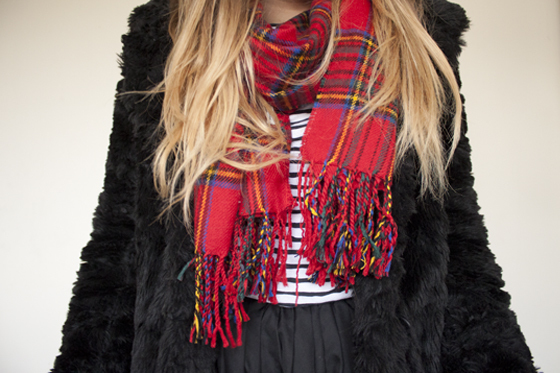 I have a scarf like this too, its lovely! I adore your black fur coat! i love how u combined this flashy red scarf to the black and white colors in the rest of your outfit. I love rings and I absolutely adore your rings. Definitely following you! i can´t take full photos because i have no room, but i don´t really care if outfitphotos are full lenghth or not. shoes are not importent for me. 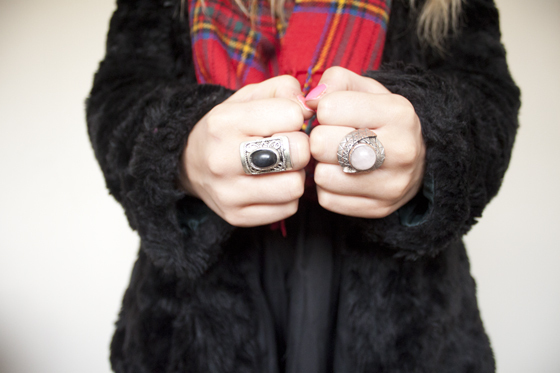 love the scarf & the rings! I quite like the full length picture! And your tartan scarf is really lovely!! I love the pop of color from the scarf. Great thought about changing it to full length, looks better! The full length photos look great! You're gorgeous! I'm just about to put an order in for 3 of your rings, so excited to get them! I can never find any like this around the highstreet! Ohh, this post does make me want to buy that tartan scarf I've been watching on eBay for a good few months! I should stop being cheap, haha. Love it, though I'd need a darker crimson colour to suit me. Works well with your fur coat! LOVE LOVE LOVE that tartan beauty! At first glimpse I thought you'd dip dyed the tips of your hair red! Love your scarf and liking the full length photos. Hope you had a lovely Christmas! Hey! I see your feet! wonderful! great outfit! The scarf is so festive, i love it! Hope you had a lovely christmas missy! ahhh the scarf is sooo nice, and really has that "festive feeling"
Even if you had to pick out the tacky "love" you gotta admit RI is getting less tacky these days, thank goodness. Sometimes they're still tacky, but usually in that its-so-tacky-its-good way haha. Also, random I know, but loving your eyebrows hehe. I love the scarf, seems great for the weather and season. Gorgeous scarf :) perfect for Christmas! you look so warm and cute! i love that fur jacket. i really like the whole outfit actually. good one. Love this outfit! Esepcially the scarf, you look beautiful! I have a Knoad kit! its AMAZING isn't it? I love the full length, and that scarf is amazing! Gorgeous scarf :) I was looking at a green tartan scarf yesturday and loved it, but I'm not much of a scarf wearer lol! Oh, and love the full length pics, and didn't notice the change till you said lol!